The development of distributed systems is influenced by several paradigms. For example, in the last few years, great emphasis has been placed on Service Orientation. In addition, technologies such as Web services are now considered standard, deployed in common development tools and widely used. However, despite this recent trend, the constantly growing number of powerful personal devices will inevitably revitalize the interest in another paradigm known as Autonomous Agents. 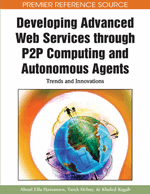 Agents are in fact considered one of the main building blocks of the emerging next generation Web infrastructure. Web services are very important resources for agents. Agents should be able to retrieve, execute and compose Web services, providing an intelligent and personalized support to users. On the other hand, agents should also be able to export their functionalities as Web services in order to be fully integrated in the Service Oriented paradigm. In this chapter we present a survey of the current state of the art about Web services integration in open Multi-Agent Systems (MAS). Considering these approaches, we identify a set of requirements needed to achieve full integration and we present a communication infrastructure, which satisfies these requirements. This section defines the key terms and concepts used in the rest of the chapter. An open Multi-Agent System is a MAS where new agents can be added dynamically to cooperate with the existing ones. Agents can also dynamically leave the MAS when their tasks terminate. An open Agent Platform is a runtime infrastructure that supports a minimal set of basic mechanisms: creating and terminating agents, naming agents (providing a notion of agent identity: a property that distinguishes each agent from all others) and connecting agents (supporting their communication).